Prime Minister Benjamin Netanyahu has visited 10 Downing Street in London where he met with UK Prime Minister Theresa May. 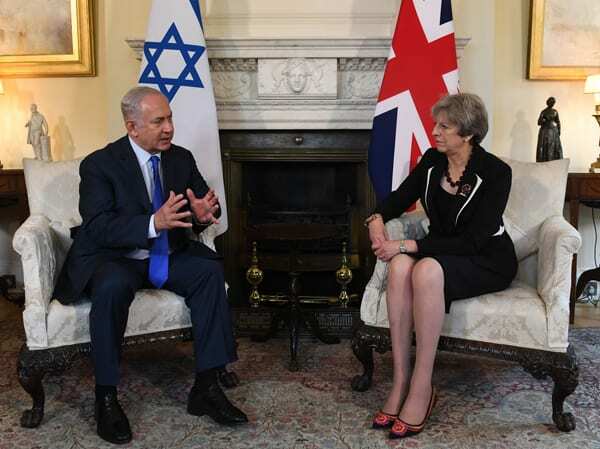 Prime Minister Netanyahu told the U.K. leader that he thanks her for inviting him “to mark with pride a great historical event, a great event in Jewish history, British history and world history”. He told her: “A hundred years ago, the Balfour Declaration helped pave the way for the reestablishment of an independent state for the Jewish people in our ancestral homeland. A hundred years later, our two countries, our two democracies – Israel and Britain – are strong allies and partners. We cooperate closely on intelligence. We cooperate closely in the battle against terrorism. And we’ve saved, through this cooperation, countless lives – British lives, Israeli lives. We cooperate in cybersecurity, in technology, in business and enterprise. We share the values of freedom and democracy and peace. Israel is committed to peace, I’m committed to peace. A hundred years after Balfour, the Palestinians should finally accept the Jewish national home and finally accept the Jewish state. And when they do, the road to peace will be infinitely closer. In my opinion, peace will be achievable. But there are great things that are happening in the Middle East, because many Arab countries now see Israel not as an enemy, but as their indispensable ally in the battle against militant Islam. The threat we all see is a resurgent Iran that is bent not only on dominating the region, but bent on developing nuclear weapons. The goal that I have in mind is not keeping or eliminating the deal; it’s improving the deal and correcting its main flaws. And I think those who want to keep the deal should cooperate in correcting the deal.